D23: Wouldn’t You Think My Collection’s Complete? Ariel said it best when she said, “I’ve got gadgets and gizmos a-plenty!” Ever since my boyfriend discovered my love for Disney every gift has been Disney related. As a result I have acquired quite a collection of Disney artwork, figurines, and dolls. One look at my childhood bedroom, and I think you’ll agree that my collection is complete. That was until we heard that D23 was coming to town once again. D23 is held at the Anaheim Convention Center every two years. At this year’s Disney Expo we viewed upcoming trailers for movies like “Maleficent” & “Thor: The Dark World“. We saw sneak peaks of movies currently filming like “Cinderella” & “Tomorrowland“, and had access to some limited edition items at the Disney Store. All I can say is that I’m incredibly excited for the new Disney film line up. Actors like Angelina Jolie, Tom Hiddleston, Kristen Bell, and Indina Menzel were in attendance to promote their new films. Yes, Angelina Jolie is incredibly gorgeous in person, and very kind. Infinity, the new Disney interactive game was one of the exciting products introduced at the Expo. After playing this game I can attest to it’s one of a kind experience. Your kids will love playing this game, and you can get in on the fun playing as one of your favorite Disney characters. View clips from this exciting new game here or purchase your very own game here. 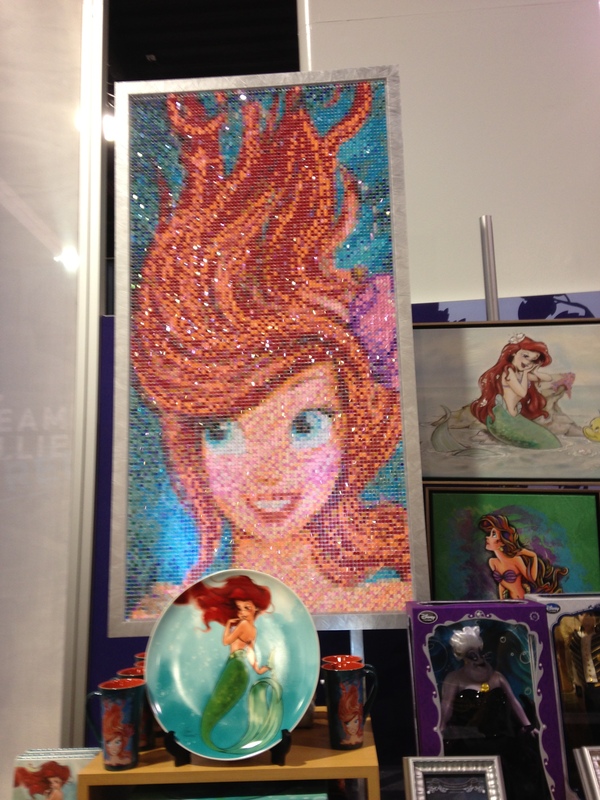 At the D23 pop up Disney store we were able to view upcoming product lines. I think you’ll be excited about some of the products hitting stores this fall. The Disney Fairytale Designer Collection features some of your favorite princesses in dresses designed with stunning detail. The unique thing about this collection is that it includes both prince and princess. The collection includes Rapunzel & Flynn Rider, Jazmine & Aladdin, Snow White & Prince Charming, Bell & the Beast, and Ariel & Prince Eric. The dolls are being released one at a time. The time to purchase Snow White & Charming has already passed, but you can purchase Rapunzel & Flynn now. To view future release dates visit the Disney info page here. All doll sets are priced at $129.95. There are only 6,000 of each doll made world round, so supplies are very limited. In addition to the dolls, the Disney Fairytale Designer Collection features journals, tea cups, jewelry, make up, clothing & more. To view the Fairytale Designer Collection page click here. In addition to the Fairytale Designer Collection, Disney also unveiled their new line of “It’s a Small World” dolls. I know I’m not the only one who growing up wondered why the iconic ride’s dolls were not for sale. The new dolls feature the iconic song sung in each doll’s respective language. View the dolls in action here before they go on sale. The dolls will be released just in time for this year’s holiday season. Guess what you’re little girl will want for Christmas? 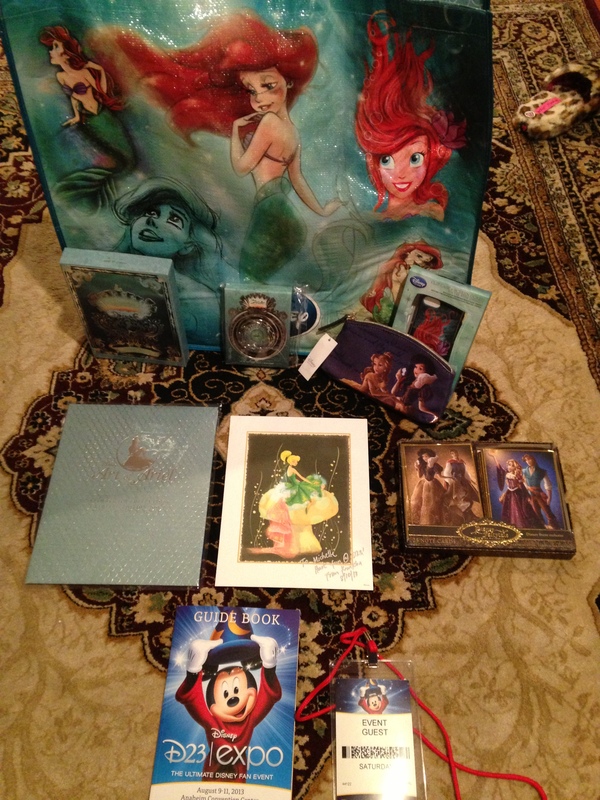 Some items I picked up at D23 included limited edition Little Mermaid artwork, 1 of only 500 Fairytale Designer Collection makeup bag, and one of a kind paintings of Tinkerbell. The next D23 Expo will take place in Anaheim,CA in 2015. Until then don’t forget to visit your local Disney Store or Disneystore.com for the latest one of a kind items. I hope my collection is finally complete, then again there’s always something new I just have to have!